Hello Sea Gull Nation! We hope you are planning to join us for Sammy’s SU Flock Party and to experience our Sea Gulls in action on the gridiron. This website is designed to answer your questions and provide information to make your flocking experience exciting, fun and safe. Please review it carefully and note the important phone numbers that can provide additional information and assistance. Join us as we root the Sea Gulls on to victory. Go Gulls! September 22 The College of New Jersey 6 p.m.	 4 p.m.
Sammy will provide ALL food and beverages. Please do not bring your own. Just bring your wallet and your license. Salisbury University will provide trash receptacles and portable restroom facilities. Gulls and their guests are asked to pick up their droppings! A limited number of games and activities will be provided, no need to bring your own. The Flock Party begins two hours prior to the game and ends at game time. Flock then support the team! After flocking you must attend the game. 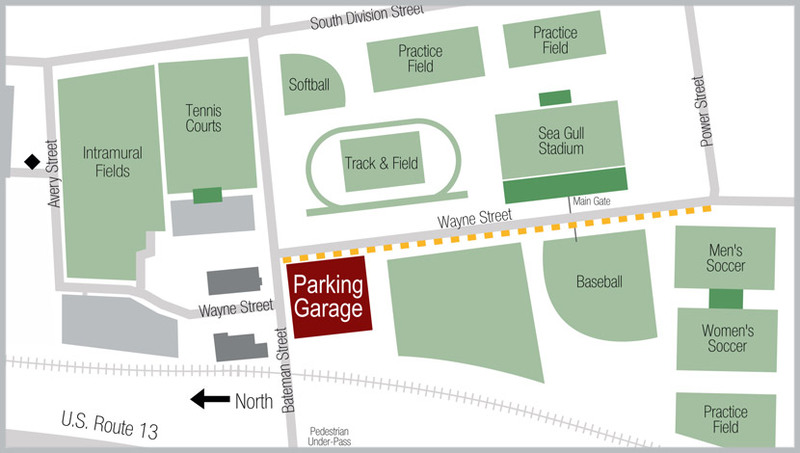 The Flock Party will be located on Wayne Street, adjacent to the stadium. The road will be blocked off to vehicular traffic and FLOCKING WILL BE WALK-IN ONLY. Please park in the garage or in the Avery Street Parking Lot. Set your GPS to 1123 S. Division St., Salisbury MD 21801 and when you get close look for the signs. The University will provide food and alcohol service. Participants are NOT permitted to bring in their own alcohol/food. Please bring ID. Guests will be provided with wristbands that makes them eligible to purchase alcohol. Possession of unauthorized alcohol may result in arrest, student conduct consequences, or revocation of flocking privileges. The University reserves the right to cancel a Flock Party as a result of inclement weather, unsafe field conditions and/or excessive community disruptions. Respect the rights of others. Avoid the use of loud and/or abusive language, music and behavior. Designated restroom facilities are located in the Flock Party area. Guests are asked to keep the facilities clean and report any concerns to the appropriate staff. The University reserves the right to prohibit and/or inspect bags and backpacks before permitting entry to the area. For the safety and security of others, pets are not permitted in the Flock Party area. Failure to cooperate with University authorities, maintain a safe and clean environment, or abuse alcohol may result in conduct sanctions, criminal arrest or forfeiture of the opportunity to participate in future Flock Party activities. Please be smart. We want everyone to enjoy themselves. Following these policies and being respectful of others can make this a safe and enjoyable experience for everyone. Gates open one hour prior to the scheduled start time. Tickets for football can be purchased at the Sea Gull Stadium ticket booth.